Amaiyah F. Walker is a bright young lady who is showing everyone that South Carolina students can indeed compete with other gifted and talented children across the United States. Amaiyah is a 7th grade student at Sandy Run K-8 school in Swansea, South Carolina. She is receiving one of the 2017 Dr. Martin D. Jenkins Scholar Awards from the National Association of Gifted Children (NAGC). The award is named in honor of Dr. Jenkins, Father of Research on Gifted Blacks, and it is designed to honor the achievements of highly gifted Black students who excel academically in school. Since its inception in 2014, the Jenkins Scholar Induction and Awards Program has been co-sponsored by the NAGC Special Populations Network and the NAGC Gifted Racial Accountability and Commitment to Equity (GRACE) Special Interest Group. 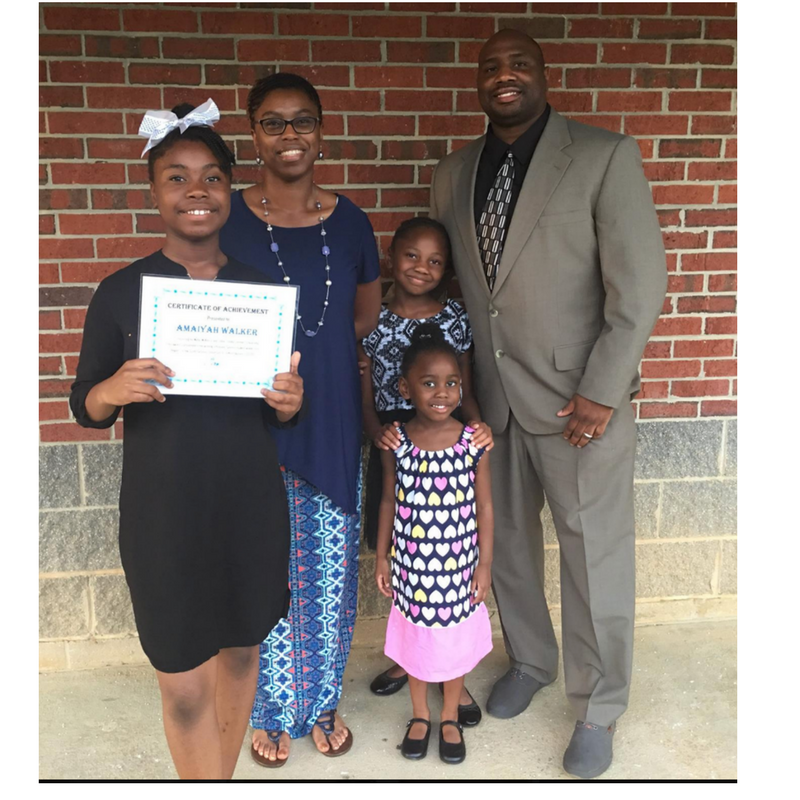 Prior to receiving this award, Amaiyah was one of the 2016 recipients of the Melba McKenzie and LeAnn Crosby Scholarship from the South Carolina Consortium for Gifted Education (SCCGE). As a result of the scholarship, she had the opportunity to participate in Clemson University’s Project WISE (Woman In Science and Engineering) Summer Camp. In an interview with Amaiyah and her parents Randy Walker and Stephanie Boyd-Walker, My SC Education sought to learn more about Amaiyah’s special gifts and her families education choices. Mr. Walker, please tell us about your family. First, the Walker family would like to express our deepest gratitude to My SC Education for embracing us with open arms into your esteemed community. Our immediate family is made up of five people. My wife and I are the proud parents of Amaiyah, Kendyl, and Alayna Walker. Our family has a Military background, which in the past afforded us the opportunity to accumulate multiple relocation addresses, on a frequent basis. No matter where we went, educational opportunities were the highest common denominator on our list of concerns. As a Retired US Army Veteran, I love taking advantage of quality time with my children. I have the luxury of being intimately invested into all of my children, so I make every effort to instill morals and values into their everyday lives. As an educator, my wife provides 21st century teaching strategies for our children, that supplement and reinforce what they learn at school. We are firm believers that our children will thrive if they are given adequate support at home that is coupled with innovative school choice options. Can you tell us more about your education journey and the education option you are currently using? Calhoun County Public Schools District 1 – Sandy Run K-8 is a good school nestled into a modest community! My children are engaged by their curriculum and look forward to going to school each and every day! I count it a blessing to be a parent of three Gators (Sandy Run Students). My youngest daughters that are aged 4 and 8, are content, and very happy to be in an environment conducive to learning. My oldest daughter Amaiyah, has continually exhibited exponential growth in her academic maturation over the past couple of years. At this point, my wife and I deem it necessary to actively explore a variety of school choice options that would better suit her needs. Attending a school that offers experiential field trips, competitive clubs, along with a wide variety of athletic opportunities is what we are looking for. Amaiyah, what would you say is the most exciting thing about your school? If I had to choose the most exciting thing about my school, then it would be having fun in the Game-Truck! My school gives incentives to students that meet the assigned Accelerated Reader Program Goals with game play! What advice would you give parents who are looking for supplemental education opportunities for their children? As parents, you must strive to be a great advocate for your kid(s). Team up with your children’s school and formulate a plan to fully meet all areas of your kid(s) needs. Additionally, if you want to go it alone and don’t know where to start, there is a wealth of information and groups on the internet. There is an almost infinite amount of free or paid content that can enrich your children lives! Fill in this sentence: Having a choice in education matters because __________. Having a choice in education matters because you only get one go-round at both primary and secondary mind construction (K-12). You should not need research to tell you that having a solid primary educational foundation, will allow you to build a secondary shake-proof educational framework. It is essential that all of our kids have access to the type of program that fits their needs!